Congratulations! 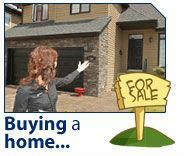 You have decided to purchase a home, or are thinking about buying one. You'll be joining the ranks of hundreds of Michigan families who realize that home ownership offers a number of benefits including building equity, saving for the future, and creating an environment for your family. When you own your own home, your hard-earned dollars contribute to your mortgage. The equity you earn is yours. Over time, your home will increase in value. When your ready feel free to set up a no obligation sit down meeting with us to go over what to expect in the near future during this process. I guarantee you will be happy you did!